5. Ningbo Urologic and Nephrotic Hospital, Ningbo 315000, China. Early diagnosis and surveillance for metastasis and recurrences are critical issues of urologic cancer. Deregulation of long non-coding RNAs (lncRNAs) has been implicated in urologic malignancies and represents potential markers or therapeutic targets. However, the utility of lncRNA as biomarkers appears to be overstated due to heterogeneous or irreproducible results from different studies. Thus, a critical and cautious review on the biomarker potential of lncRNAs is needed. This review provides an update on new findings of lncRNA-based markers for urologic cancer. The diverse mechanisms and associated examples of lncRNAs involved during the carcinogenesis of prostate cancer, bladder cancer and renal cancer were discussed in a more balanced and critical manner, as were the suitability of lncRNAs as diagnostic or prognostics markers. Keywords: lncRNA, long non-coding RNA, urologic cancer, translation, marker. The global efforts in transcriptome mapping have suggested the pervasive transcriptional potential of human genome and identified numerous non-coding transcripts. Based on the length, the non-coding RNAs can be divided into small non-coding RNAs (<200 bp) and long non-coding RNAs (lncRNAs) (> 200bp) [1, 2]. Reviews on functions of lncRNAs in cancer have been published, describing repeatedly current knowledge on prominent cancer lncRNA candidates. Specific reviews on lncRNAs with regard to urological cancers have also been published [3-6]. LncRNAs may exhibit tissue- or disease-specific expression which can provide potential biomarkers. However, the utility of lncRNA as biomarkers appears to be overstated due to heterogeneous results from different studies. In many cases, initial reports could indeed not be replicated. The story of prostate cancer gene 3 (PCA3) is a good illustration of how long and tedious the path to a clinically successful biomarker really is. Thus, a review on the biomarker potential of lncRNAs should be critical and cautious. This review provides an update on findings of lncRNAs in urological cancer by assessing the literature until March, 2016 from PubMed and discusses the suitability of lncRNAs as diagnostic or prognostics markers in a balanced and critical manner. LncRNAs function through a variety of mechanisms (Figure 1), e.g. as (i) recruiters regulating gene expression in cis and in trans; (ii) scaffolds that assemble chromatin remodeling machinery at the site of regulation; (iii) decoys that titrate away and prevent the action of effector molecules; (iv) mediators of alternative splicing; (v) precursors for small ncRNAs. Understanding this functional versatility is critical for the clinical exploitation of the lncRNAs. Many lncRNAs are highly enriched in the chromatin fraction where they regulate transcription regulation through the recruitment of chromatin remodeling complexes. Such lncRNAs can alter epigenetic states either in cis or in trans. Many lncRNAs overlap protein-coding genes but are transcribed in the antisense orientation. Antisense RNAs are well suited for cis-regulation of their sense counterparts. The locally accumulated antisense RNAs are assumed to recruit chromatin remodeling proteins through either RNA-RNA or DNA-RNA recognition rules and trigger heterochromatin formation for gene silencing. A growing list of the validated sense-antisense pairs has been implicated in urologic cancer. One typical example is the action of antisense ncRNA in the INK4 locus (ANRIL). ANRIL mediates silencing of a cluster of tumor suppressor genes, including its sense partner p15/CDKN2B through SUZ12 (a PRC2 component) and the p16/CDKN2A and p14/ARF locus via CBX7 (a PRC1 subunit). RASSF1 antisense RNA 1 (RASSF1-AS1) is a tumor suppressor involved in cell cycle and apoptosis in prostate cancer . RASSF1-AS1 forms an RNA-DNA hybrid at the RASSF1A promoter and recruits PRC2 which specifically represses RASSF1A transcription. C Terminal Binding Protein 1 Antisense (CTBP1-AS) is a key antisense ncRNA upregulated in prostate cancer and negatively correlated with its sense gene CTBP1 . CTBP1-AS recruits transcriptional repressor PSF and histone deacetylases to CTBP1 promoters and represses CTBP1 expression in cis. CTBP1-AS also inhibits tumor suppressors in trans via the PSF-dependent mechanism thus facilitating prostate cancer initiation and progression. Another example of the RNA guiding mechanism could be seen by the action of the ncRNACCND1 expressed at the 5'-regulatory region of the cyclin D1 (CCND1) gene . ncRNACCND1 is expressed upon DNA damage and recruits the RNA binding protein TLS that represses CBP/p300 activities on CCND1 in cis, causing gene-specific inhibition. Other antisense lncRNAs were found to be inversely related to their antisense partners in urological cancer, e.g. TRPM2-AS, CBR3-AS1, 5' and 3'aHIF-1α, ZEB2NAT and MDC1-AS. But the precise mechanisms underlying the regulation of sense transcript have yet to be deciphered. TRPM2-AS  is consistently upregulated in prostate cancer and inversely related to its antisense transcript TRPM2, dictated by methylation degree of the CpG island. TRPM2 silencing leads to decreased susceptibility to cell apoptosis and necrosis. CBR3 antisense RNA 1 (CBR3-AS1) is significantly upregulated in primary prostate tumors and PCa cells . Silencing of CBR3-AS1 downregulates AR, inhibits cell growth, and increases apoptosis in both androgen-dependent and independent LNCaP cells. Cui et al. suggested a reciprocal regulation of CBR3-AS1 and AR in a positive feedback loop in prostate tumorigenesis. While others characterized 5'aHIF-1α and 3'aHIF-1α, two antisense transcripts at the 5' and 3' end of the human hypoxia-inducible factor-1α (HIF-1α) gene  respectively in kidney tumor specimen. 5'aHIF-1α and 3'aHIF-1α are involved in different regulation mechanisms and are activated under different environmental stress and histological cell types. 3'aHIF-1α binds to the 3'UTR of HIF-1α and down-regulates HIF-1α translation. Moreover, 3'aHIF-1α is overexpressed specifically in non-papillary kidney cancer and could discriminate between papillary and nonpapillary renal cell carcinoma . 5'aHIF-1α is involved in membrane transport and mediates the HIF-1α pathway. Recently, Zhuang et al. reported a novel antisense lncRNA ZEB2NAT of ZEB2 that enhances the invasion of UBC cells through the TGFβ1-ZEB2NAT-ZEB2 axis. Xue et al. identified antisense lncRNA MDC1-AS that upregulates the expression of tumor-suppressing MDC1 in bladder cancer. Several cis-regulatory lncRNAs are also functionally involved in genomic imprinting, which is an epigenetic event whereby one parental allele is preferentially silenced to maintain the allele-specific expression. Disturbed imprinting in XIST, CDKN1C/KCNQ, H19/IGF2 and DLK1/MEG3 loci is commonly observed in urologic cancers. X-inactive specific transcript (XIST) is a 19 kb long lncRNA expressed exclusively from the inactive X chromosome. It mediates X chromosome inactivation in female mammalian cells to balance the X-chromosome genes dosage between the male and female. XIST recruits PRC2 to the polycomb group transcription factor YY1, which can load the XIST-PRC2 complex onto the Xic and initiate H3K27me3 throughout the Xi. XIST promoter is hypomethylated in prostate cancer tissues and cell lines [16, 17]. An additional example is the KCNQ1 opposite strand transcript 1 (KCNQ1OT1) in the KCNQ1 imprinted gene cluster. KCNQ1OT1 is paternally expressed and bidirectionally silences cis-linked imprinted genes of the centromeric domain. KCNQ1OT1 binds both PRC2 and G9a to promote two different repressive histone marks H3K27me3 and H3K9me3, thereby mediating the silencing of the flanking genes. On the maternal chromosome where ICR2 promoter is methylated, KCNQ1OT1 is silenced and the imprinted genes are transcribed. Altered expression and functional implication of KCNQ1OT have been investigated in bladder cancer , prostate cancer , Beckwith-Wiedemann syndrome (BWS) [20, 21], Wilms' tumors  as a consequence of disturbed imprinting. Defective imprinting in H19/IGF2 locus is also a common event in bladder cancer and Wilms tumors. H19/IGF2 harbors conversely imprinted IGF2 and H19 expressed from the paternal and the maternal alleles respectively. In bladder cancer, the H19 promoter is paternally hypomethylated , causing biallelic expression of H19 and silencing of IGF2. The induced H19 promotes cell growth by regulating ID2 expression  and also contributes to metastasis by associating with enhancer of zeste homolog 2 (EZH2) and inhibiting E-cadherin transcription . Unlike the situation in bladder cancer, Wilms tumor is linked to a gain in methylation on the maternal allele [26, 27]. Biallelic methylation of the H19 promoter silences H19 and causes biallelic expression of IGF2, thereby stimulating cell growth. In BWS, the epigenetic H19 silencing increases the risk of developing childhood tumors . DLK1/MEG3 locus is structurally and epigenetically similar to the IGF2/H19 domain. The locus contains the paternally imprinted non-coding MEG3 and the maternally imprinted DLK1. DLK1 and MEG3 are prevalently downregulated in prostate cancer , bladder cancer [28, 29] and primary renal cell carcinoma (RCC) tissues  caused by the epigenetic silencing across the 14q32 imprinted gene cluster. Despite prominent examples of lncRNA action in cis, lncRNAs also affect a large number of genes in trans. The HOX transcript antisense RNA (HOTAIR) guides both histone modification complexes PRC2 and LSD1 to their target genes genome-wide and mediates epigenetic silencing. HOTAIR expression is elevated in castration resistant prostate cancer  and renal carcinoma cell lines . linc-UBC1 also functions as recruiter in trans. linc-UBC1 is overexpressed in primary bladder cancer. It recruits PRC2 complex and increases H3K27Me3 in the promoter of CCND2 and HOXA5 and depressed their expression. Knockdown of linc-UBC1 inhibits proliferation and compromises invasiveness, cell motility and metastasis. Emerging evidence indicates that lncRNAs serve as molecular scaffolds that mediate chromosomal looping between distal enhancer and promoter. Yang et al. suggested that PCa non-coding RNA 1 (PRNCR1) and prostate cancer 2 gene expression marker 1 (PCGEM1) mediate chromosomal looping to regulate androgen receptor (AR) dependent transcription. PRNCR1 interacts with the AR and recruits DOT1-like histone H3K79 methyltransferase (DOT1L), which in turn methylates AR. The activated AR binds to PCGEM1, which recruits pygopus family PHD finger 2 (PYGO2). PYGO2 recognizes H3K4me3 at gene promoters. Subsequently, a complete loop from a distal upstream enhancer to the promoter is established leading to the activation of the androgen-responsive genes. However, the role of PRNCR1 and PCGEM1 in AR activation was challenged by later researches. Prensner et al. observed no evidence for their interaction with the AR. Parolia et al. showed that PCGEM1 is uniformly distributed in PCa cell nucleus and cytoplasm, and remains unaltered upon AR activation. Hung et al. found that PCGEM1 promotes proliferation not via AR activation, but through c-Myc activation. Therefore, the role of PCGEM1 and PRNCR1 in castration resistant prostate cancer (CRPC) remains uncertain. A recent study  indicated two additional lncRNAs MALAT1 and Taurine upregulated gene 1 (TUG1) serving as sub-nuclear molecular scaffolds that mediate growth control gene relocation between nuclear structures. TUG1 is upregulated in bladder urothelial carcinoma. It selectively guides the methylated Pc2 on growth control gene promoters to the co-repressor complexes in PcG bodies for transcription repression. MALAT1 interacts with unmethylated Pc2 in the activation environment of the ICGs for transcription activation. Another means by which lncRNAs regulate transcription is to act as decoys. In this archetype, lncRNAs sequester biomolecules away from natural target and prevent them from fulfilling functions. This kind of lncRNAs always antagonize transcription regulators, so knockdown of these lncRNAs may lead to gain-of-function of its targets . One particular type of lncRNA decoy involves proteins. lncRNA can bind to transcription-factors that would otherwise bind to the DNA promoters and thereby inhibit gene transcription. The second chromosome locus associated with prostate-1 (SCHLAP1) is a protein-interacting lncRNA implicated in tumor invasion and metastasis and upregulated in aggressive PCa . Mechanistically, SCHLAP1 co-immunoprecipitates with SNF5, a core unit of the SWI/SNF complex and impairs the SWI/SNF-mediated epigenetic regulation. SWI/SNF complex is a well-documented chromatin regulator with tumor suppressor function. This complex remodels the chromatin and physically moves nucleosomes at gene promoters to control transcription. In contrast to SCHLAP1 which is pro-survival, Growth-Arrest Specific 5 (GAS5) is a tumor suppressor with a pro-apoptotic role in prostate cancer. GAS5 has a stem-loop structure in its sequence that mimics the glucocorticoid responsive gene. GAS5 binds to glucocorticoid receptors and prevents its genomic binding. This results in the suppression of GR responsive genes such as anti-apoptotic cIAP2  and ultimately induces growth arrest . GAS5 can also inhibit transcriptional stimulation of progesterone receptor and androgen receptor in a similar fashion. Since androgen receptor is critical in prostate cancer cells survival, down regulation by GAS5 may inhibit pro-survival signaling via the androgen receptor pathway. 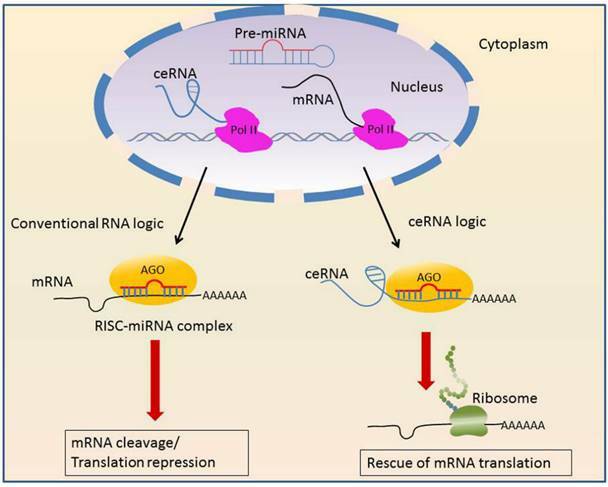 LncRNA decoys not only proteins, but also microRNAs. In this context, lncRNAs act as competing endogenous RNAs (ceRNAs) that sponge microRNAs to interfere with their function (Figure 2). A prominent example is the PTENP1, pseudogene of the tumor suppressor PTEN [42, 43]. PTEN and PTENP1 share multiple miRNA target sites, therefore PTENP1 competes for the same set of regulatory miRNAs that normally targeted PTEN to modulate PTEN expression . PTEN is commonly lost in advanced PCa  and clear cell renal cell carcinoma (ccRCC) . The restoration of PTEN inhibits tumor cell proliferation . The prostate cancer associated transcript 1 (PCAT1) is another lncRNA as miRNA antagonizer. PCAT1 is the top-ranked, upregulated lncRNA in prostate cancer tissues. PCAT1 disrupts miR-34a mediated down-regulation of cMyc  and promotes proliferation. Further, PCAT1 downregulates the tumor suppressor gene BRCA2 , similar to microRNA mediated mRNA degradation. MALAT1 also serve as a ceRNA through interfering with miR-200s and increases ZEB2 expression in ccRCC . Urothelial carcinoma-associated 1 (UCA1) acts as a nature decoy that blocks miR-16 to inhibit ROS formation, thus promoting tumorigenesis in bladder cancer . Recently lncRNAs have been shown to act at a post-transcriptional level by regulating alternative splicing of pre-mRNAs. MALAT1 is enriched in nuclear speckles, a sub-nuclear domain that is enriched with various pre-mRNA splicing factors including Serine-Arginine (SR) protein. MALAT1 harbors a large number of SR protein binding sites. It modulates the phosphorylation of Serine-Arginine (SR) splicing factors and mediates their distribution  in the nuclear speckles, thereby controlling the localization of splicing factors at active transcription sites. 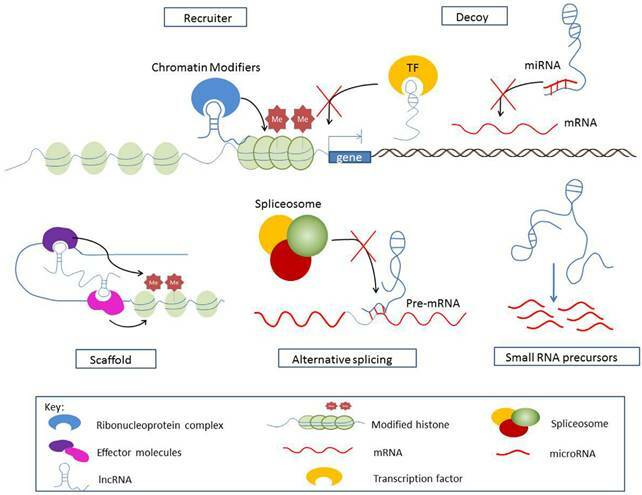 Besides SR, MALAT1 also interacts with other pre-mRNA splicing factors, e.g. PRP6 and TDP-43. MALAT1 loss-of-function alters alternative splicing pattern of pre-mRNAs such as tissue factors and endoglin which are important in cancer biology. LncRNAs can function as primary precursors for other small ncRNAs deregulated in cancer. It is estimated that at least 4% of lncRNAs host small ncRNAs. For example, H19 hosts miR-675 in first exon. miR-675 is a tumor suppressor involved in the regulation of developmental genes . It inhibits cell proliferation in response to stress or oncogenic signals . GAS5 encodes 10 different small nucleolar RNAs (snoRNAs) in its introns . Interestingly, only a subset GAS5-encoded snoRNAs are upregulated in progressing PCa , suggesting that RNA products derived from the same precursor transcript could function through separate mechanisms at post-transcriptional levels. Many lncRNAs are expressed in a tissue or cancer specific manner. They are often stable in biological fluids and could be easily detected using qRT-PCR amplification. The specificity and stability of lncRNAs have prompted efforts to evaluate their potential as biomarkers for diagnosis, prognosis, therapy response and therapeutic targets. A list of putative lncRNA biomarkers is summarized in Table 1. Mechanisms of competing endogenous RNAs. lncRNAs involved in urologic cancer. Recently several lncRNAs transcribed from cancer risk loci have been identified. 8q24 gene desert region, for example, harbors several lncRNA genes, e.g. PCAT1 and PRNCR1. 8q24 is a key prostate cancer predisposition locus associated with PCa susceptibility. GWAS have discovered within the lncRNAs multiple prostate cancer-associated SNPs for risk prediction. rs378854 in 8q24 region is associated with expression of oncogenic lncRNA PVT1 in PCa . A further lncRNA at the 8q24 region is PRNCR1  transcribed between rs1456315 and rs7463708. It is most significantly related to PCa susceptibility in the Japanese. SNPs in the H19 gene are also associated with the risk of bladder cancer . rs2839698TC and rs2107425CT in H19 significantly reduce risk of non-muscle-invasive bladder cancer. rs16834898 and rs6434568 in PCGEM1  indicate a lower PCa risk with Chinese population. However, how these variants affect cancer susceptibility remains to be elucidated. Early diagnosis of primary and recurrent cancers followed by timely treatment will significantly decrease mortality. The most common screening test for prostate cancer early detection to date is serum PSA screening. However, the use of PSA lacks specificity and fails to discriminate aggressive tumors from indolent cancers, leading to unnecessary biopsies and overtreatment. Thus there is a continued need for more sensitive and specific biomarkers for prostate cancer early detection that supplement PSA. Numerous efforts have been applied to transcriptome-wide study of urological cancer and found numerous urological cancer associated lncRNAs. The most promising among these is the PCA3. PCA3 is specifically overexpressed in malignant prostate tissue and absent in indolent prostate conditions or cancers of non-prostate origin. PCA3 has demonstrated a superior specificity and accuracy to serum PSA. Moreover, PCA3 is detectable in post-DRE urine samples in urine and urine sediments, therefore enabling noninvasive diagnose. For this reason, PCA3 has been translated into the clinical setting. A PCA3 assay PROGENSA® has been approved by the FDA as a diagnostic method to aid in the decision of repeat prostate biopsies . Despite the improved specificity, the lower sensitivity of PCA3 renders it insufficient as a standalone biomarker. However, the inclusion of PCA3 can improve the diagnostic accuracy of other clinical variables. The combination of urinary PCA3 and TMPRSS2:ERG is currently being addressed in two independent multi-center trials [60, 61]. A multiplex marker panel consisting of PCA3, PSA, TMPRSS2:ERG, sarcosine and annexin A3 also showed improved diagnostic accuracy for PCa . Combining PCA3 scores with the Prostate Health Index (Phi) improves specificity in prostate cancer diagnosis than single marker alone . In addition to PCA3, several other urine biomarkers were under investigation for the detection of PCa. Wang et al. observed that urinary MALAT1 score outperforms the conventional %free PSA in PSA grey zone cohorts (4-10 ng/mL). MALAT1 could detect more cancer cases and save avoidable and repeated biopsies. The exosomal lincRNA-p21 in urine is diagnostically superior to PCA3 in distinguishing PCa from benign prostatic hyperplasia (BPH) . lincRNA-p21 is a tumor suppressor stimulated by the p53 protein. Once transcribed, lincRNA-p21 binds to the hnRNP-K complex and suppresses expression of the genes regulated by p53. LncRNA FR0348383  is upregulated in PCa compared with matched benign tissues. FR0348383 transcript in post-DRE urine has diagnostic value for patient cohorts especially in the PSA grey zone. The application of FR0348383 score could avoid 52% unnecessary biopsies without missing high grade PCa. Besides urine, diagnostic value of lncRNAs in circulating blood was also evaluated. For example, a MALAT1 derived fragment, MD-miniRNA is differentially expressed in the serum and plasma of PCA patients [67, 68]. MD-miniRNA can distinguish positive prostate biopsies from negative at AUC of 0.841. Compared with PSA, MD-miniRNA has better specificity but lower sensitivity for PCa detection. However, the sensitivity of MD-miniRNA increases in higher grade tumor samples, which suggest that MD-miniRNA may selectively detect aggressive PCa patients. Combined MD-miniRNA and PSA could improve diagnostic sensitivity and specificity. The 5' region of the XIST gene is commonly less-methylated in PCa irrespective of XIST expression . Identification of a XIST hypomethylated fragment in serum may have tumor diagnostic potential for PCa . UCA1 is a well-documented oncogene in bladder cancer which promotes cancer cell growth, invasion and drug resistance [69-71]. Since its first description in 2006 , many studies have confirmed UCA1 to be specific and sensitive marker for bladder cancer diagnostic or follow-up [69-75]. UCA1 is especially sensitive in diagnosis of superficial high grade (G2-G3) TCC cases [74, 75]. Functionally, UCA1 may exert pro-tumor activity by activating PI3-K signaling pathway  and Akt signaling pathway [70, 76]. More recent studies  put forward that UCA1 promotes cell growth by downregulating the cell cycle inhibitor p21 via BRG1. UCA1 is upregulated in bladder cancer cells under hypoxic conditions induced by transcription factor Ets-2 , CCAAT/enhancer binding protein α (C/EBPα)  and hypoxia-inducible factor-1α (HIF-1α) . The correlation between these molecules under hypoxic conditions remains unclear. UCA1 is also involved in glucose metabolism in bladder cancer . The variant transcript of UCA1, UCA1a (CUDR) also plays a role in bladder cancer progression. Upregulated UCA1 and UCA1a have been shown to enhance resistance to cisplatin in bladder cancer cells [71, 81], suggesting their role in chemoresistance . However, many claims above are based on single reports with small cohorts for which replication studies are mostly lacking. According to a recent report , the diagnostic value of UCA1 in bladder cancer is lower than previously reported and its role in the follow-up of recurring tumors is limited. Thus UCA1 is currently not recommended as standard diagnostic tools in routine urology. UCA1 can be used only to complement cystoscopy and cytology in the early diagnosis when a primary bladder cancer is suspected. In addition to UCA1, the differential expression pattern of several other lncRNAs has been reported in bladder cancer. PCAT-1  and H19 [24, 84] were up-regulated in bladder cancer compared with normal controls. On the other hand, MEG3 expression is decreased in bladder cancer . SncmtRNA and the ASncmtRNAs in urine can detect tumor cells with different grades, and were suggested as a non-invasive diagnostic tool . For renal cancer, there is still no reliable biomarker available for daily practice despite numerous efforts. The study of lncRNAs is limited to a few samples that were analyzed by microarrays. Five recent studies investigated the lncRNA expression profile of RCC tissues using microarray technologies. However, the samples sizes are small (n=6 ; n = 4 ; n = 6 ; n = 11 ; n=15 ) and lack validation cohort, thereby limiting the value of the studies. Nevertheless, it is obvious that unique lncRNA expression profiles exist in RCC. In accordance with prostate and bladder cancer, MALAT1 is also overexpressed in RCC than benign renal tissue or cell lines [48, 91]. MALAT1 silencing inhibits RCC cell proliferation and promotes apoptosis. Hirata et al. found that MALAT1 is transcriptionally activated by c-Fos downstream of the VHL pathway and interacts with Polycomb protein EZH2 to induce epithelial-to-mesenchymal transition (EMT). LncRNAs are also strong predictors of tumor recurrence and patient outcome. H19 has been advocated as a potential prognostic biomarker for early recurrence in bladder cancer. Hochberg et al  first reported altered expression of H19 in bladder cancer. H19 upregulation is related to an increased risk of biochemical recurrence and shorter metastasis-free survival . linc-UBC1 overexpression is a negative prognostic marker for lymph node metastasis in bladder cancer . Upregulation of HOTAIR may be closely associated with recurrent and poor prognosis of bladder cancer. HOTAIR upregulation associates with increased risk of recurrence in stage Ta/T1 bladder cancer  and affects invasiveness and differentiation state of urothelial cancer cells in a cell type specific manner. Upregulation of HOTAIR is also correlated with histological grades and overall survival in bladder transitional cell carcinoma (TCC) and inhibits chemosensitivity to doxorubicin . Elevated SPRY4-IT1 is strongly correlated with aggressive clinicopatholigcal features and poor prognosis in bladder cancer and provides an unfavorable prognostic factor . Upregulation of MALAT1 in bladder cancer corresponds to the tumor grade and metastatic stage [81, 99-101]. Experiment showed that MALAT1 induces EMT to promote bladder cancer cell migration by associating with suz12  and activating Wnt signaling . In PCa, high SChLAP1 expression is correlated with biochemical recurrence, clinical progression and mortality. It significantly predicts metastatic progression in high-risk PCa patients who had undergone radical prostatectomy and lethal mCRPC [39, 103]. Recently an RNA in situ hybridization (ISH) assay for SChLAP1 was developed for the detection of aggressive prostate cancers . PCGEM1 and PRNCR1  were previously identified to be highly overexpressed in aggressive PCa. While PCGEM1 is confirmed by later studies to be associated with prostate cancer, PRNCR1 does not exhibit convincing upregulated expression [34, 35]. Prensner et al. contradicted the prognostic value of PRNCR1 in aggressive PCa by analyzing a large cohort of high-risk prostate cancer patients. They claimed that PRNCR1 does not demonstrate a convincing association with poor patient outcomes. Several studies have reported a significant correlation between PCA3 score and prognostic parameters. However, the prognostic value of PCA3 is controversial. Other independent studies [105, 106] found no significant correlation between the PCA3 score and clinicopathologic variables. HOTAIR is overexpressed in CRPC cell lines , tissues , and after androgen deprivation therapies. Further study demonstrates that the HOTAIR directly binds to AR to protect it from ubiquitin-mediated degradation, and thus drives androgen-independent AR activation and promotes CRPC. GAS5 transcript level is significantly lower in metastatic prostate cell lines compared with normal prostates. Down-regulation of GAS5 has been found to mediate the progression of CRPC. PCAT1 is specifically upregulated in high-grade PCa, independent of chromosome 8q24 amplification, and has been implicated as a prognostic biomarker for prostate cancer metastasis and poor overall survival . The upregulation of TRPM2-AS associates with poor clinical outcome and has been characterized as a high-risk PCa marker . PCAT18 is highly up-regulated in metastatic PCa, and is able to discriminate between localized PCa and metastatic CRPC . PCAT5 was also reported as a CRPC-specific biomarker . Linc00963 is differentially expressed in the androgen-independent and metastatic PCa cell line and is responsible for the androgen-independence transition . Overexpression of MALAT1 in PCa tissues is related to high Gleason score, late tumor stage and CRPC. In vitro MALAT1 silencing inhibits metastasis of CRPC cancer cells and leads to cell cycle arrest. In vivo knock-out of MALAT1 inhibits growth of tumor xenografts [113, 114]. MALAT1 associates with the N-terminal of EZH2 through 3′ end and enhances EZH2-mediated migration and invasion in CRPC cell lines. Knockdown of MALAT1 impairs EZH2 recruitment to its target loci and represses oncogenetic activity of EZH2 . Du et al. reanalyzed array-based PCa expression profiles and identified 2 metastases relevant PCAN-R1 and PCAN-R2 as potential drivers of cancer progression. Recently, Malik  identified low PCAT29 expression correlated with poor prognostic outcomes. For renal cancer, several independent indicators of clinical outcome have been identified in patients with ccRCC. SPRY4-IT1 is significantly correlated with advanced clinical stage, lymphnode metastasis and poorer prognosis in ccRCC . ccRCC patients with higher H19 level have more advanced clinical stage and worse overall survival . Decreased expression of NBAT-1  is associated with the progression and poor prognosis of ccRCC. Upregulated RCCRT1 is correlated with tumor stage, histological grade and lymph node metastasis . Recently, Malouf et al. established a molecular subclass of ccRCC through lncRNA-based clustering and identified cluster C2 to associate with aggressiveness and poor overall survival. Anti-cancer strategies based upon lncRNA biology are rapidly emerging. The therapeutic concepts could be either to suppress the oncogene expression or to activate tumor-suppressive lncRNAs. Direct targeting of oncogenic lncRNAs is an attractive strategy for treatment of cancer. A straightforward method is to interfere with RNA expression via antisense technologies. RNAi-mediated gene silencing has recently gained momentum as a treatment modality. Many studies have used RNAi to knockdown spliced lncRNAs. However, RNAi activity is restricted to the cytoplasm and cannot be deployed against a nuclear localized lncRNA. Other possible lncRNA targeting agents are catalytic nucleic acids (CNAs) such as ribozymes and DNAzymes, which can also bind and cleave lncRNA targets and repress their expression. An alternative approach would target lncRNA interactions and silence their function. This can be achieved by the use of small molecule inhibitors that block the binding site of their protein partners. Disruption of these molecular interactions compromises the repression of the tumor suppressors and reactivates their function. For example, using small molecular inhibitors of PRC2 to block its interaction with ANRIL would be a promising therapeutic strategy. The tumor-specific expression of lncRNA has prompted investigation into its utility in targeted anticancer therapy. One typical example is the use of H19 regulatory sequences for the treatment of bladder cancer. The BC-819 DNA plasmid, which contains diphtheria toxin controlled under the H19 promoter, has been designed to treat target cells with overexpressed H19 . When BC-819 enters a cancerous cell, the Diphtheria Toxin A (DTA) chain is synthesized under the regulation of H19. This allows precise targeting of tumors without excessive harm to healthy tissue. A multicenter trial of intravesical BC-819/PEI is ongoing in patients with superficial TCC . A pivotal (Phase III) bladder cancer clinical trial has commenced in 2015. A similar vector H19-DTA-P4-DTA  is also under consideration for bladder cancer therapy. H19-DTA-P4-DTA expresses the DTA fragment under the control of two separate promoters from H19 and IGF2-P4. The vector exhibits increased anti-tumor activity than the single promoter vectors. Alternatively, one can also manipulate the expression of tumor-suppressive lncRNAs in anticancer therapy. One example is the protein decoy GAS5. Its downregulation was described in prostate cancer cell lines , RCC  and bladder cancer . GAS5 expression inhibits androgen receptor signaling, promotes growth arrest and apoptosis . Therefore, upregulation of GAS5 could provide a possible treatment. Based on the observation that mTOR expression is inversely correlated with GAS5 in PCa cell lines, Yacqub et al. examined mTOR inhibition as a strategy to enhance GAS5 levels in several prostate cancer cell lines. The ever-growing number of lncRNA-based marker candidates stands in sharp contrast to the lack of reliable biomarkers for urological cancer. The biggest challenge is the limited validity. The candidates generated by different labs are non-overlapping or even contradictory [129, 130]. As discussed earlier, the prognostic value of PCA3 is controversial . The prognostic value of PRNCR1 in aggressive PCa remains uncertain. It remains to be proven whether UCA1 is a suitable diagnostic urinary biomarker in bladder cancer. Aberrant expression of individual lncRNAs in RCC by small-scaled studies, i.e. GAS5 [122, 126], aHIF , MALAT1  could not be confirmed. Most current studies aim to identify single molecules as biomarkers, but one size does not fit all. These studies ignore the dynamic molecular interactions and fail to address the heterogeneity of cancer. There is an obvious need to extend the biomarker discovery from single molecules to the functional modules, pathways and the networks. Some systematic studies of lncRNA markers have proliferated recently. As an example, our colleagues  have constructed a mRNA-lincRNA coexpression network in PCa using RNA-Seq expression data and characterized PCa-associated lincRNA modules as putative biomarkers. This inter-laboratory inconsistency stems largely from the intrinsic features of cancer. First, the development of cancer is systems-oriented, involving the crosstalk between multiple biological components. Also the cancer is highly heterogeneous, not only between patients, but also within the same individual . Most current studies however, aim to identify single molecules as biomarkers, but one size does not fit all. These studies ignore the dynamic molecular interactions and fail to address the heterogeneity of cancer. There is an obvious need to extend the biomarker discovery from single molecules to the functional modules, pathways and the networks. Some systematic studies of lncRNA markers have proliferated recently. As an example, our colleagues  have constructed a mRNA-lincRNA coexpression network in PCa using RNA-Seq expression data and characterized PCa-associated lincRNA modules as putative biomarkers. An additional bias lies in the deficiencies in the population under analysis. The current lncRNA marker candidates are mostly based on discovery-driven approaches that frequently use small sample sizes. This type of analysis is prone to statistical overfitting of high-dimensional data, producing the “p >> n” paradigm. Thus, the potential lncRNA markers have yet to be prospectively validated in standardized, well-controlled clinical trials across large numbers of patients. Thus, the diagnostic and therapeutic benefits of many potential lncRNA markers have yet to be prospectively validated in standardized, well-controlled clinical trials across large numbers of patients. Many more important questions remain to be addressed. In most cases lncRNA function is not fully understood. It is also not clear whether deregulated lncRNAs are drivers in the disease etiology or they are merely a consequence of the disease. Although aberrant expression of lncRNAs argues in favor of functional significance, but most publication have not described a direct association or causal role for lncRNAs in cancer, therefore its functional role in urological biology is largely unknown. Assigning functions to lncRNAs may seem like a daunting task. For most lncRNAs, function is solely predicted by bioinformatic tools without any mechanistic understanding and experimental validation. The guilt by association analysis  has also been used to infer the function of an lncRNA based on their expression correlations with neighboring protein-coding genes with known functions. However, direct experimental test is still important to understand the lncRNA function. The classical experimental strategy would involve the depletion of lncRNA and assessment of the effects on gene expression and tumor-relevant phenotypes. Identification of protein interaction partners is also informative to decipher lncRNA mechanisms at the molecular level. A direct way would be the RNA affinity purification, or RIP-Seq to identify lncRNA-interacting proteins. Two methods, called chromatin isolation with RNA purification (ChIRP)  and capture analysis of RNA targets (CHART) , represent complementary approaches to study RNA-chromatin interactions. ChIRP and CHART have uncovered thousands of PCGEM1 occupancy sites. These methods will help to create an experimentally validated interactome of lncRNAs. Unraveling the function of lncRNAs is more difficult than miRNA. The difficulties come from the relatively low sequence conservation of lncRNAs. However, the main functionality of lncRNAs may reside in its secondary structure motifs imperative for specific interaction. This is demonstrated by the double stem-loop structure of HOTAIR for PRC2 binding and the structure of MEG3 critical for its tumor suppressor functionality . It will be highly informative to understand the sequence motives and functionally active RNA domains that govern lncRNA functionality. The lncRNA-based therapeutics also has many important questions to be addressed. Targeting lncRNAs with small-interfering RNAs is not trivial due to the large transcripts size and the extensive secondary structures in lncRNAs. In addition, the development of robust delivery system, optimization of dosage regimes and amelioration of off-target effects require intensive investigation in the future. LncRNA is shedding light on the understanding of the urological malignancies. Their potential utility in cancer biology and therapy can be tremendous. We remain cautiously optimistic that when the limitations described above are overcome, lncRNAs may be used as promising markers or therapeutic targets to benefit patients. ANRIL: antisense ncRNA in the INK4 Locus; CAN: catalytic nucleic acid; CBR3: Carbonyl Reductase 3; CBR3-AS1: CBR3 antisense RNA 1; CBX7: chromobox homolog 7; CCND1: cyclin D1; ccRCC: clear cell renal cell carcinoma; CDKN1C: Cyclin-dependent kinase inhibitor 1C; CHART: capture analysis of RNA targets; ChIRP: chromatin isolation with RNA purification; cIAP2: cellular inhibitor of apoptosis 2; CRPC: castration resistant prostate cancer; CTBP1-AS: C terminal binding protein 1 antisense; DLK1: delta like homolog 1; DOT1L: DOT1-like histone H3K79 methyltrasferase; DTA: Diphtheria Toxin A; EMT: epithelial -mesenchymal transition; EZH2: enhancer of zeste homolog 2; GAS5: growth-arrest specific 5; GDF15: growth differentiation factor 15; GWAS: Genome Wide Association Studies; HIF-1α: hypoxia-inducible factor 1α; HOTAIR: HOX transcript antisense RNA; HOXC: Homeobox C; ICG: interchromatin granule; IGF2: Insulin-like growth factor 2; LOI: loss of imprinting; MALAT1: metastasis-associated lung adenocarcinoma tran-script-1; MEG3: maternally expressed 3; mTOR: mammalian target of rapamycin; NKD1: naked cuticle homolog 1; PCA3: prostate cancer gene 3; PCAT-1: prostate cancer associated transcript 1; PCAT29: prostate cancer-associated transcript 29; PcG: Polycomb body; PCGEM1: prostate cancer 2 gene expression marker 1; PRC1: polycomb repressive complex 1; PRC2: polycomb repressive complex 2; PRNCR1: PCa non-coding RNA 1; PYGO2: pygopus family PHD finger 2; RASSF1A: Ras-association domain family member 1A; RCC: Renal cell carcinoma; RIP-Seq: RNA immunoprecipitation and sequencing; SCHLAP1: second chromosome locus associated with prostate-1; SUZ12: suppressor of zeste 12 homolog; SWI/SNF: switch/sucrose non-fermenting; TCC: transitional cell carcinoma; TUG1: taurine upregulated gene 1; Xist: X-inactive specific transcript. This work was supported by the National Natural Science Foundation of China grants (31400712, 31470821, 91530320) and Technology R&D Program of Suzhou (SYN201409). Corresponding author: professor Bairong Shen, email: bairong.shenedu.cn.